Ex-prime minister will serve less than one year, in a specially constructed bloc with TVs in each room, and wear civilian clothes. Former Prime Minister Ehud Olmert will apparently enjoy deluxe conditions in jail, after being sentenced to 18 months in prison for receiving a 60,000 shekel (over $15,000) bribe when he was Minister of Industry, Trade and Tourism. He had been sentenced to six years in jail for two bribery charges, but the Supreme Court partially accepted his appeal Tuesday and exonerated him of the bribery charges in the Holyland affair, reducing his jail sentence by 75%. Olmert is expected to serve under 12 months in jail, assuming a third of his sentence is knocked off for good behavior. Israel Hayom reported that be will be incarcerated in Bloc 10 of the Ma'asiyahu Jail in Ramle, which holds mostly white collar offenders, child support debtors and the like. He will share a cell with two prisoners and receive visits once every two weeks. Olmert is the first Israeli prime minister to be sentenced to jail. The fact that he is who he is, and that he has been privy to the most sensitive state secrets, makes it impossible to keep him incarcerated among regular prisoners. Therefore, the Israel Prisons Service (IPS), with guidance from the Israel Security Agency (ISA or Shabak), renovated one of the blocs in Ma'asiyahu Jail and readied it for prisoners who must be separated from the rest of the prison population. The bloc will be guarded by the IPS alone, and will have ten cells, each with up to three inmates. Other convicts from the Holyland scandal who are deemed to be under threat may also be incarcerated there. The bloc will include a clubhouse, a canteen as well as a kitchen and dining room. There will be a television in each cell, and each prisoner will have the right to subscribe to a newspaper. 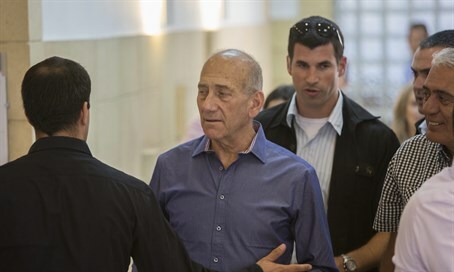 Olmert and the other prisoners will be allowed to wear civilian clothes in the bloc. They will have to wear orange prison suits during visits, and if they have to visit the infirmary. The former prime minister will begin his sentence on February 15. Olmert was found guilty in 2014 on two counts of bribery and sentenced to six years in prison, two years' probation, and a fine of one million shekels ($257,000). He was also ordered to forfeit 560,000 shekels ($144,000) in assets. While the Supreme Court has now absolved him from the charge of receiving a 500,000 shekel ($187,000) bribe, it unanimously upheld his conviction of receiving 60,000 shekels ($15,000) in the Hazera affair, which involved a company that sought permission to construct residential buildings in the former landfill of Hiria. "A heavy weight was removed from my heart when the Supreme Court ruled that I am not guilty of the main crime – the Holyland affair," said Olmert. "That was, for me, a dark cloud over my head and over my family. I have previously said that I was never offered and I never received bribes, and I say this again today. Naturally, I accept the decision of the Supreme Court." Seven other people were also found guilty in the case, including former Jerusalem Mayor Uri Lupolianski. The crimes revolved around Jerusalem's Holyland property development. Ma'asiyahu Prison is named after Ma'asiyahu Shalum, the gatekeeper to the Holy Temple, according to Jeremiah 35:4.